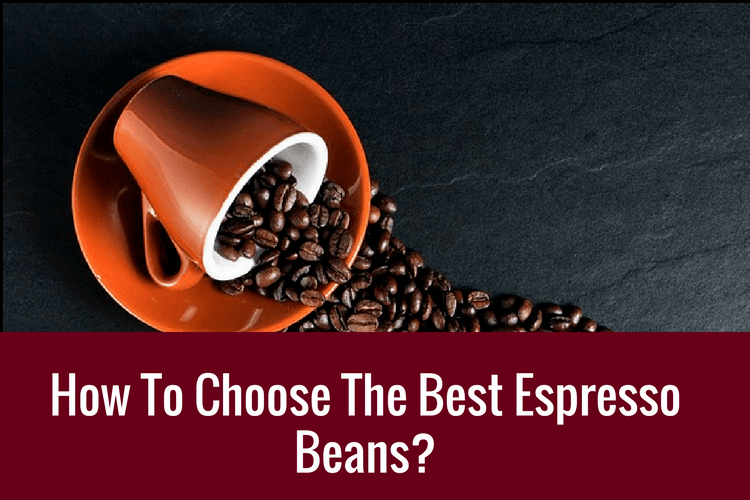 [GUIDE 2019] How To Choose The Best Espresso Beans? Congratulations! You are the proud owner of a shiny new espresso machine! Or maybe you've been making your own espresso for years and just feel like upping your game. Whatever the case, you're in the market for espresso beans, and you've quickly found that trying to figure out what everything on the package means can be more than a little confusing. But if you know what to look for, choosing your espresso beans and making your perfect cup will be no problem at all! To help you do that, we will share with you what to look for when choosing coffee beans as well as give you five recommendations on where to start! When it comes to choosing the right espresso bean for you, most of the decision comes down to personal preference. However, there are a few things that should be non-negotiable for everyone regardless of tastes. These factors apply to beans across the spectrum and will help you cut through the junk to find quality beans much more quickly. The first thing that you need to consider is freshness. The flavor of coffee quickly diminishes after roasting, so in order to get the best taste, you want to buy the freshest beans. The best way to figure out how fresh beans are, is by looking for a clearly printed roast date on the packaging. Ideally, you want to consume the coffee within three weeks of the roast date. Though for peak flavor, coffee is best served 7-14 days after roasting. After 14 days, the flavor starts to diminish, so be careful about using your beans fairly quickly! Yes, pre-ground beans do save you a little bit of time and don't require you to have a grinder, but it is absolutely worth it to buy your beans whole! As with roasting, the sooner you use coffee after it's been ground, the better your flavor is going to be. It is important to note that most of the world's coffee supply comes from developing nations in Asia, Africa, and Central and South America, and coffee farmers are especially vulnerable to poor working conditions. With things like weather, volatile prices, and lax labor laws working against them, coffee farmers are often subjected to extremely low wages and harsh working conditions. Another thing to think about is the environmental impact. Many coffee farms will clear large areas of native plants in order to grow coffee. The easiest way to figure out which coffees are ethically produced is by looking for particular certifications. While not foolproof, having a certification is a good start and is usually better than not having one. All right, so once we've eliminated all of the beans that are too old, pre-ground, and unethically sourced, we're left with a much more manageable pool to choose from. Choosing between the rest of the different variations is basically a matter of preference. There are two main species of coffee bean: Arabica and Robusta. Generally, Robusta is considered lower quality, though because it can produce a nice crema (the frothy bit at the top when you make an espresso), you'll often see it included in espresso blends. But that doesn’t automatically qualify Arabica as a high quality bean. There are still several different subspecies of Arabica beans, so it's best not to make a judgement on the name alone. A bean's roast plays one of the largest factors in determining the flavor profile of your coffee. To put it simply, the darker the roast, the bolder the flavor. So when choosing which roast you want to buy, it's good to consider how you'll be drinking your coffee. If you're going to be flavoring your drink or adding things to it, then you want to go with a darker roast as a lighter one might get lost under everything else. The majority of the world’s coffee are grown in the tropics, and there are three main regions of production: Latin America, Africa and the Middle East, and Asia and the Pacific. Just as a person’s hometown has influence over who they become, so too does a coffee bean’s origin influence its profile. - Latin America. Lighter bodied, more acidic, better for light to medium roasts. - Africa and the Middle East. Medium bodied, mildly acidic, with aromas ranging from wine and berry to chocolatey. Often used in darker roasts. - Asia and the Pacific. Heavy bodied, low acidity, earthy with herbal flavors. Coffees from this region are used in dark to very dark roasts and are sometimes considered “love it or hate it” coffees. A blend is a mixture of two or more different kinds of coffee beans that are paired together because of complementary qualities. They tend to be more balanced and are generally considered better tasting as a result. Single origin coffees, on the other hand, come from only one kind of bean. They can be much more inconsistent as weather and temperature can affect the outcome of the bean, and they are not mixed with any other beans to balance out the resulting flavor. That being said, single origin beans are great if you’re going to drink your coffee black and want to really taste the flavor of a particular location (in the same way that you might want to taste a wine from a specific place). They work particularly well in drip and french press preparations. For most of your other coffee needs, however, a blend is usually the way to go. They tend to hold up well in basically all preparations, and particularly in an espresso, where the beans are subject to a more intense extraction process, blends hold up better and maintain a more consistent flavor cup to cup. Don’t think that I’m just going to throw all that information at you without giving you some examples. Below are five picks for all sorts of coffee lovers. These are great to use as a starting point to help you figure out what to look for. This coffee is a blend of Brazilian, Central American, and Indonesian beans. When you open the bag, you’re immediately hit with a nutty aroma. But when it comes to the actual drink, it has a mild, balanced flavor that leans on the sweet side. Unlike many espresso roasts that are available, the Lavazza Super Crema doesn’t taste burnt or overly bitter and instead leaves you with a creamy, full bodied mouthfeel even without added cream. Despite being packaged as an espresso bean, it holds up as a drip coffee as well. There’s really not much to dislike about it. Even when the roast date shows that it’s over a month old, the quality remains the same. Great for storing in bulk to save some cost. This is a single origin, dark roast, Arabica coffee from Nicaragua. Full bodied with a rich aroma, it has notes of chocolate, apricot, and fig. This coffee is best prepared with a french press and served black as it tends to brew more like a medium roast than a dark one. The best thing about this coffee though is probably the fact that the company that produces it is carbon negative. Tiny Footprint plants enough trees to offset any carbon emissions that the production process from importing to roasting creates while also fighting deforestation. However, I recommend that you change the beans to another package once you open it - the original bag is a little unwieldy. This coffee makes a full bodied espresso with a whole lot of crema. It leans more toward the medium roast as it lacks the bitterness of a darker roast and maintains a more natural, winey flavor. This particular coffee is great for people who don’t normally like the richness of an espresso, and it makes a great drip coffee as well. However, for people more used to the standard dark roast espresso, this might be a bit too light for your tastes. This coffee is shade grown in Mexico and produces a mild, sweet flavor. While many medium roasts are still rather bold, this one is more of a true medium without even a hint of bitterness. Though perhaps some may find it a bit bland for that reason. Unsurprisingly, it’s best served black, but doesn’t lose all of its flavor under a little milk and sugar. Because of its mild nature, it can work well in a household with people of different coffee strength preferences, and you can brew it strong without having to worry about it becoming overwhelmingly bitter. This coffee is very clean with fruity notes. Light roast coffees aren’t for everyone, and this is no exception. It’s bright and fresh, which can come across as grassy to some people. However, you don’t need to worry about brewing it too strongly as it doesn’t get bitter, though it is strongly flavored enough to add milk and sugar to without having to worry about the flavors getting lost. And although it works well brewed with a french press or as a conventional drip, it also makes for a great cold brew! If you’re fairly new to the world of coffee beans, however, I would recommend going with the Lavazza for its versatility and consistency. As a blend, you’re more likely to get the same flavor from package to package and not have to worry about the quality of your coffee being dependent on the specific batch. And if it’s your first time making coffee at home, because it isn’t very bitter, you don’t have to worry much about accidentally making it too strong. At the same time, it does have a very rich flavor, so you can add milk and sugar to it as you please, and you’ll still be able to taste it. But in the end, half of the enjoyment of coffee is trying out new flavors and combinations and figuring out what you like and don’t through experience, so don’t be afraid to have fun with it!